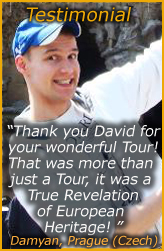 My name is DAVID and I have been organising, managing, designing and guiding in the TRAVEL & TOURS business for 30 years – but don’t worry I worked a lot with students and school groups so I am young and fun at heart and full of energy, ideas and humo(u)r!!! Had enough of standard city tour packages given by bored guides for the undemanding tourist? Tired of being ripped off by high taxi fares, tourist restaurants with average food at high prices, commercial clubs charging crazy drinks prices?… Try me for a different experience! SAVE money and enjoy the unusual non touristy experiences and places by using the friendly services of a tour organiser, planner and advisor – David! I am from the UK but lived and worked with a SWISS company most of my life starting a student INTERNATIONAL EDUCATIONAL TOURS company. Now I am based in PRAGUE specialising in TOURS management and GUIDING – offering a friendly service for the discerning and demanding visitor. I can also operate and plan tours to many other destinations (see my LIST) as well as the nearby COMBO CITIES of VIENNA, BERLIN, BUDAPEST & KRAKOW. Looking for a beautiful, historic, liberal and reasonably priced central European city to visit and enjoy? Look no further….come to Prague and I will surprise and excite you by taking you to unusual places of interest, museums, clubs and restaurants. Prague is easy to walk around but also has an excellent tram system and even a metro if speed is your priority. Allow me to help you discover the authentic spirit of Czech and Bohemian Culture and enjoy Prague’s numerous Museums, Exhibitions, Fairs, Concerts. That’s just the daytime……at night I can show you the best value or quality (depending on your budget) restaurants to suit your taste, meet some locals in the friendly bars or even dance the night away in a cool dicso/club! NEW: SHORT BREAK CITY CULTURAL & SHOPPING TOURS FOR WOMEN TO PRAGUE, VIENNA, BUDAPEST & BERLIN! Much more than a mere shopping trip…..an ideal mix of culture and pleasure. Feel like a local and seek out the best bargains, genuine local products and unique and wonderful cafes to take a break. Also the best restaurants and places to visit to suit your special interests. Get your friends together and form a small group of 10 for even better rates and more fun! Contact me for further info and possible itineraries. MIX & MATCH – I want to share with you my passion and love of this marvellous city and take you to some places that you may have missed. I’ve done a wide cultural, artistic and service research and I’ve condensed this into TOP Prague Places of Interest you should not miss! This allows you to choose the places that you prefer to visit according to your time and interests and stamina and allows ME to put together the mix in an interesting and timely way that will hold your interest and challenge you! My 30 years experience planning, operating and running tours in many countries, flexible schedule and friendly attitude means YOU the client/visitor receive the best services to suit your needs, time frame and budget. Based on past experiences I can organise, plan, assist, manage and guide in many countries and cities apart from my home city of PRAGUE! By the hour, day, week etc. according to your preferences and my availability. I have also worked with well-known personalities and officials who demand not only the best but also discretion and loyalty. Languages: Orientation Tours in English, Russian, French. Prices: The Official currency of Czech Republic is the Crown (Kc) (Koruna Ceska). Half Day Tours (about 3 hours) are from 1300 kc (1-2 pax) with special lower prices for 3 + and small groups. FULL day tours (about 6 hours with a break) are from 2500 kc (1-2 pax) with special lower prices for 3 + and small groups. BOOK as far in advance as possible to avoid disappointment and allow me to help you get the most from your trip. If you require assistance with accommodation or travel bookings in advance let David know soonest, and he’ll make the necessary bookings and answer questions!